Covering the four weeks of Advent, the 'challenge' of the title is to discover the real meaning of Advent and Christmas and avoid the tide of commercialism. Advent is an important event for the Christian family. There are two pages for each day of December up to Christmas and two extra days for those years when Advent Sunday falls in the last few days of November. Advent at home - this includes a Bible passage to be read out, taken from the Good News Bible, and a short reflection on the passage plus a few questions. Advent info - this section gives a bit of information about Advent traditions and history over the generations. 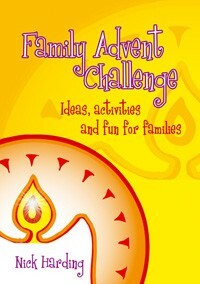 Advent activities - the activites in this section are for families to do together. This book can be used again and again. Family Advent Challenge by Nick Harding was published by Kevin Mayhew in July 2006 and is our 16260th best seller. The ISBN for Family Advent Challenge is 9781844176717. Be the first to review Family Advent Challenge! Got a question? No problem! Just click here to ask us about Family Advent Challenge.